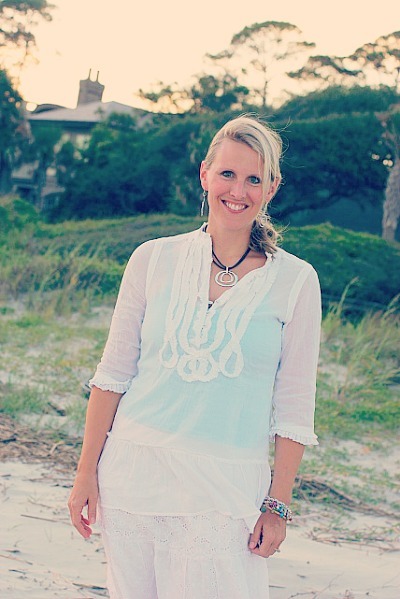 Find out how I dress in designer clothes for less. 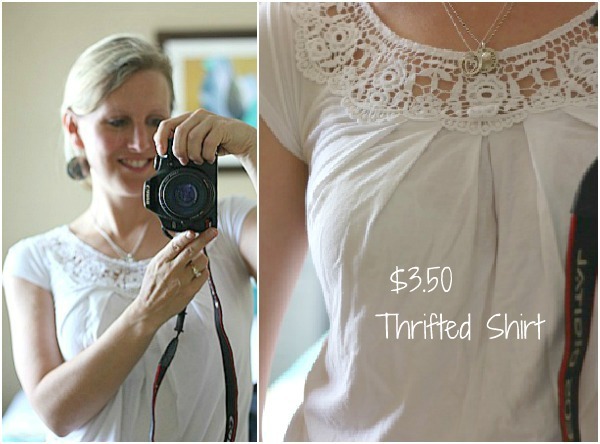 Yes, for mere pennies on the dollar, my entire outfit is less than $20, and did I mention…the majority of it second hand? One of the this year’s big color trends has been the throw back to Cinderella’s fairy tale and the all white look. Yes, it’s a dreamy, fashion statement that many of you run from because you think that sticky hand prints, baby spit up, and spilled juice stains may not the be the look you are trying to convey. One of the biggest deterrents I receive from friends who feel led to explain in lengthy detail why they just can’t shop at thrift stores is the way in which many second hand stores are organized (or not organized). For instance, Goodwills are set up by color, instead of sizes, so that is very frustrating for many. I love wearing white. It’s clean looking, fresh, and flattering, especially in the summer with just a hint of a tan, but please figure out your skin tone first. If you are cool toned, then white will be great on you, but if you are warm toned, it will wash you out and you will need to look for off white colors. I’ve shared previously about how I love to beat the fashion police and wear a bit of white in the winter with pops of color, but I find that in the summer, it’s just so easy to pull together something fashionable by just grabbing for white. This white dress I purchased a few years ago, and I still love it. I shared about it in a One Stop Wardrobe shopping post that I did early on in my Frugal Fashionista series (and I chuckle at some of things I purchased, that I would never wear now). 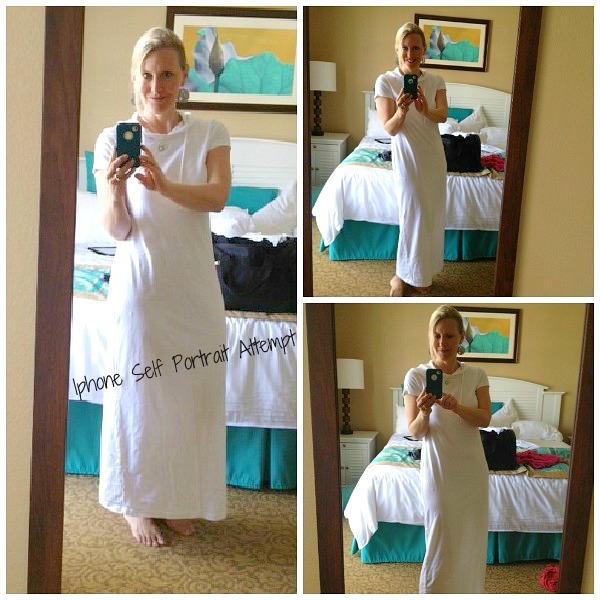 Since I am putting this post together when I am NOT at home with access to my really nice “white, frugal fashionista” wardrobe, you can see a few things that I packed, not intending that they would make it into a post. I want these pictures to just give you inspiration on how easy it is to get a great look from white. They are definitely not “model worthy,” but then this is supposed to be real life, right? This whole outfit, with jewelry was under $10. The shirt, skirt and tank top were all yard sale finds for $1/each. 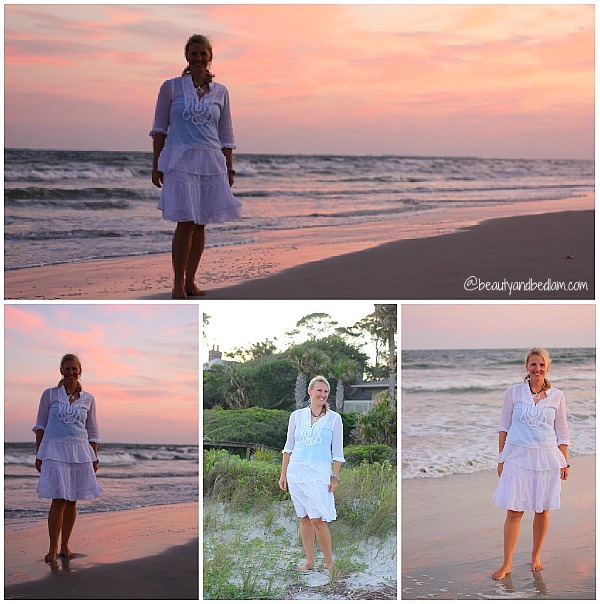 There’s always something so beach-y about a walk on the sand in white. 🙂 And, I wasn’t trying to dress up in this picture. I just find that cotton skirts in the summer are much more comfortable and flattering than shorts, so I have been buying them up at all yard sales. Remember how I love looking for details? The detail on this collar makes it perfect to dress up or down. Paired with shorts, it’s perfect for the day running errands, but if I matched it with loose flowing linen pants, it suddenly becomes quite dressy. 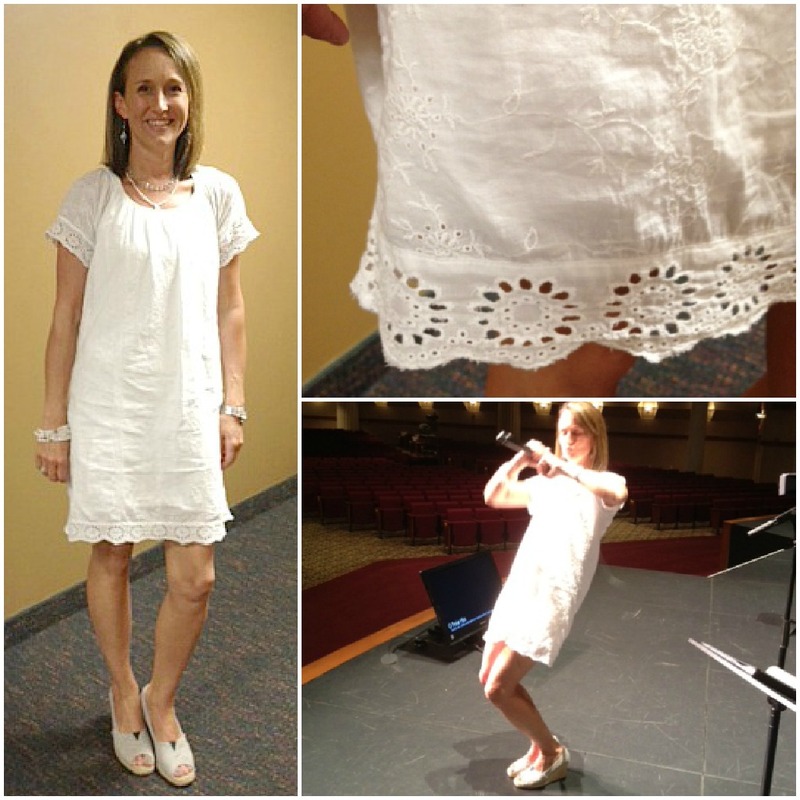 And speaking of detail, how ironic is it that I showed up at my band rehearsal and my sweet, fun friend, Angela, was wearing exactly what I was talking about – ALL white with cool detail at the bottom. No, she assured me, not a second hand dress, but great inspiration in how wonderful it looks. 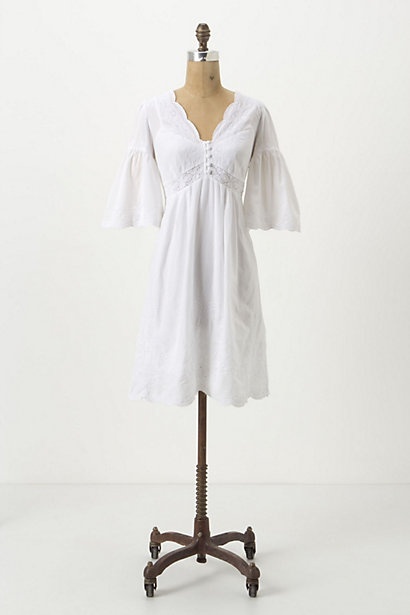 This long, hooded (which you can’t see, but it’s so cute) cotton dress is another one I can sleep in, but I don’t. 😉 For $1 at a yard sale, I snatched it up knowing it would be so comfy and cute. This is a picture from before my big hair cut. It never made it to the blog because it was one of those that didn’t quite make the cut, but since I am sharing day to day looks, this is an easy one. This yard sale sleeveless tank is one which I wear with everything. 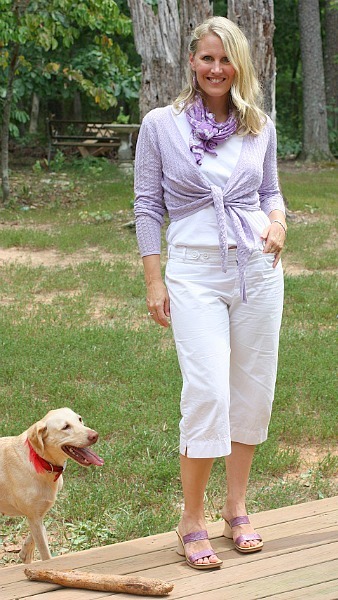 By pairing it with my white capris and a pop of purple, it takes the white on white look in a different direction. If I take the purple shawl off, then it’s all white on white. And look at the adorable picture that was messaged to me just yesterday. 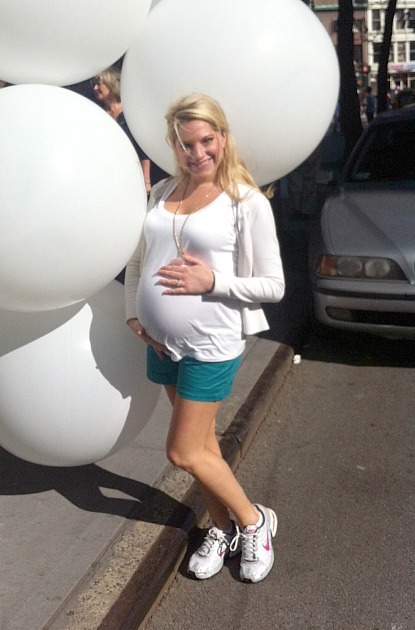 My precious niece, very pregnant, sporting some wonderful white. (And no, we won’t groan at the fact, she seriously looks like she just put one of those balls in under her shirt. That NEVER happened to me, with my “gained 50 pounds with each pregnancy” look. Don’t let your curves scare you away from giving the all white fashion statement a try. 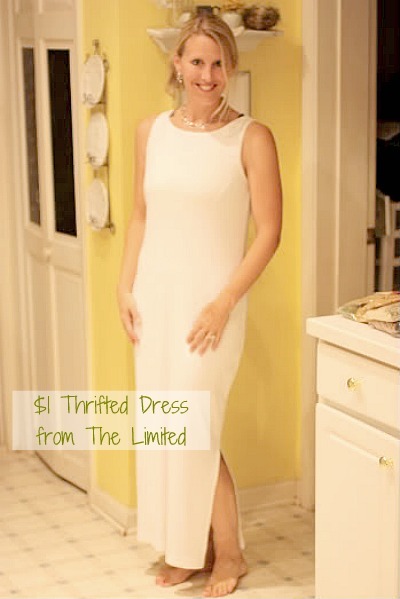 Queen Latifa looks wonderful in her white dress, and she proves that white can be beautifully flattering. In my opinion, when one owns their size, it’s empowering. That is what I thought immediately when I saw this picture, and she proves it! I thought I would just share some inspiration pictures to let you see examples of how great white, on white, can be. Don’t forget small pops of color like this belt and unique bracelet. I love this inspiration from The Limited. This shows more of a soft silver huge on white, which is very elegant. This gives you options for tucking the shirt in or out – both which look great. These don’t necessarily meet my frugal fashionista prices, but they are having a great sale of 25% off their already reduced sale items, with another $15 off of $50 if you use Deal Code 404. We know we are all good when celebrities are rocking the look. I love the heels peeking out from the white jeans. 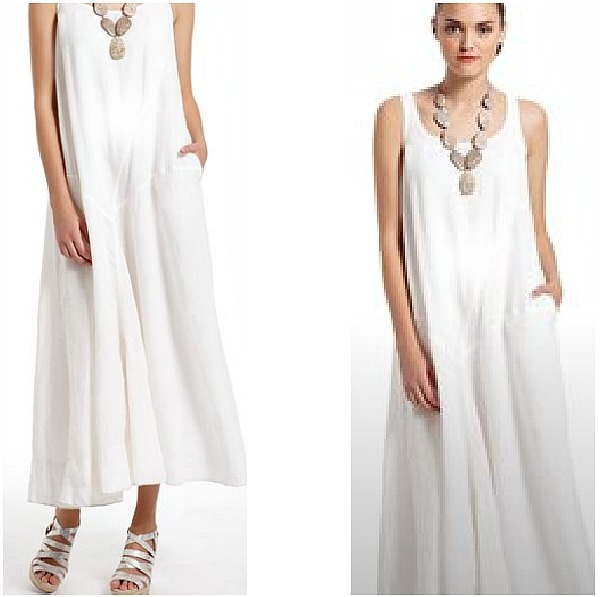 White summer dresses are everywhere, and I love how she accessorized this with a bold statement piece necklace. I am so thrilled I came across this look because it gave me a new perspective on a pop of color. I would NOT have thought to be so bold as to put brighter shoes with an all white look, but I think it’s fun and daring and I am quite tempted. Hopefully, you can take a new look at your wardrobe and see what white on white outfits might come together for you. Give this summer fashion trend a try. It’s perfect for Frugal Fashionista wardrobes. Do you ever wear ALL White Fashions? Our Goodwill decided to organize all the clothing by size and color this past year and as a result, it’s my favorite thrift store to go to because of the ease of looking through clothes! Size AND color?? Wow, now that does make it wonderful. I am a frequent Goodwill shopper, but have not found most of them organized by color. I recently visited 3 Goodwill stores in the Myrtle Beach, SC area and found that they #1 have a frequent shopper card AND were mostly organized by color. I wish Charlotte area stores would think about doing that. I have a list in my closet of what items my wardrobe is lacking; right now, it’s a red jacket, red capris and red sandals. I use Goodwill when I’m copying outfit ideas from the magazines and/or Chico’s, Coldwater Creek and Talbots catalogues I receive. Chicos has wonderful jewelry, so I go to Bijuju for jewelry at reasonable prices. I found them while at Myrtle Beach also. Bijuju is costume jewelry at reasonable prices and it looks wonderful. The 3 stores I visited were all organized by color. Anyone visiting Myrtle Beach should visit these boutiques for ideas if nothing else. I signed up at the website and got a coupon today. Last summer, I bought an antique cotton petticoat and have been consistently preferred white tanks as tops for it. It feels so summery and cool on days like yesterday when it’s 105 degrees here…. Thank you for this wonderful post! I was recently watching a show where they basically said any woman who carries a little weight should avoid wearing white on the bottom. I had just purchased a pair of white capris that I loved and felt really good because they were solid proof of my weightloss success. I have not worn those since hearing that statement. They are a size 14, so not stick thin, but not overly large either. As I read your post it struck me how I was not owning my body shape and allowing someone else to dictate what I allowed to influence my self image. Thank you for helping me shake out of that ridiculousness. I have 2 daughters and would never want them to feel insecure because of something they hear on TV, so I better start living that example. you are so welcome!! Definitely rock those white pants. I bet you look fabulous in them and they are just so fun for summer. @Melissa, I’m about a size 12 and I have a pair of white capris. I think it depends on the kind of top you wear with the white capris to make them look good. For example, pairing the white capris with a boring, basic T-shirt or a tight T-shirt will make you look bottom heavy. But if you try a colorful flowing, longer shirt with great details it works. Plus, add some hoop earrings and a fabulous necklace for some added flair. Also, add a great pair of sandals or blinged out flip-flops to really rock the outfit. Honestly, most capris of any color don’t look good on women of any size unless they have the right top and accessories. The worst part about white is keeping them clean while you’re wearing them. And don’t ever put self-tanner on right before wearing white capris. Trust me I learned the hard way last year. LOL. By the way, I second your remark about “size doesn’t always matter” at the thrift store. The items I bought ranged from sizes 2 – 8. Another plus about thrift shopping is that usually the clothes are already worn and washed, therefore, pre-shrunk for you when you try it on! That’s why I buy all my jeans second-hand.